Tradition’s good. Lots of folks are going to have turkey and/or ham on their table, as usual, this Christmas. And if you’re a hunter, go bag your own bird or hog, and then you’ll have something to brag about while you, your family, and your friends sip on those glasses of Rutting Ridge Cabernet. So, do your bird—roast it, smoke it, deep fry it—whatever, but let’s add a twist to the menu. As the old saying goes, variety is the spice of life. 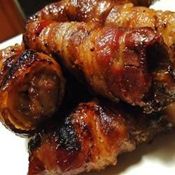 And if you’re an elk hunter, you just might steal the show, food-wise, on Christmas Day by adding bacon-elk wraps. That’s right, your mouth’s probably already starting to water. Another thing: replace that sweet potato pie with sweet potato cheesecake. Be a bit daring, too, with a side dish featuring wild rice, nuts, and dried fruit. That’ll get the crowd’s attention. Green beans? Buy fresh ones—or pick ’em and boil ’em, al dente. Add some extra virgin olive oil, salt, and garlic powder, and toss. Big winner! 1. Cut meat into one inch squares. 2. Wrap each piece with a strip of bacon about 2-1/2 inches long. Pierce through the bacon and meat with a toothpick to secure the roll. 3. Skewer 6 to 7 “wraps” onto a bamboo or metal skewer, then place on a broiler rack or outdoor grill. 4. Broil or grill until one side is lightly brown, turn and cook other side. 5. Serve hot. Makes 24 to 30. Tips: For gamey meat, marinate the meat chunks in soy sauce for about 30 minutes before cooking. To kick it up a notch, grill some fresh asparagus, place the spears in the center of an appetizer tray, and surround with bacon-elk wraps—nice prelude to that traditional Christmas Day feast we mentioned. This recipe compliments of Marge Bailey of Cody, Wyoming.